Iranian President Hassan Rouhani's arrival in New Delhi represented a continuation of India's robust outreach to West Asia, and interestingly comes on the heels of the Modi government's much-celebrated engagement with one of Iran's biggest enemies in the region, Israel. In fact, Rouhani's trip comes at a time when Israel has marked the presence and advances of Tehran-backed Shiite militias on its borders with Syria and commenced a military campaign against them. Last week, Syrian SAM systems shot down an Israeli F-16 conducting a strike against these Shiite militias. Analysts have highlighted this front as one of the region's most dangerous fault lines. Yet India's relations with Iran have remained generally stable in recent years, notwithstanding hiccups during the period of peak sanctions against Tehran by the U.S. administration of Barack Obama and the current narrative created by President Donald Trump's ad-hoc foreign policy. During the visit of Rouhani, wide-ranging and constructive discussions on bilateral, regional and multilateral issues were held in a cordial atmosphere. In recalling the principles on development of bilateral relations articulated in the 'New Delhi Declaration' of 23 January 2003, the two sides expressed satisfaction at the progress made in bilateral ties since Prime Minister Narendra Modi's visit to Iran in May 2016 and reiterated their common resolve to further intensify and strengthen multifaceted bilateral cooperation. The two leaders noted that the mutually beneficial ties between the two countries were based upon the strong foundations of the two millenia old cultural and civilisational connect. They shared the view that strengthened bilateral relations also contribute to regional cooperation, peace, prosperity and stability. President Rouhani and Prime Minister Modi agreed to further intensify and diversify the existing high-level engagement through frequent and wider range of bilateral exchanges at all levels. In this context, it was decided to convene within this year the meeting of the India-Iran Joint Commission and all its Working Groups, Foreign Office Consultations, dialogue between defence and National Security Council structures of the two countries, Policy Planning dialogue, and to promote Parliamentary exchanges. The two sides recognized the unique role of Iran and India in promoting multi-modal connectivity within and across the region. The successful inauguration of the Phase-1 of Chabahar Port in early December 2017; the ratification of the Trilateral Agreement between India, Iran and Afghanistan on Establishment of International Transport and Transit Corridor by all sides; and the successful shipment of wheat assistance from India to Afghanistan through Chabahar Port have opened a new gateway to and from Afghanistan, Central Asia and beyond. Both sides reiterated their commitment for early and full operationalisation of ShahidBeheshti Port at Chabahar. The Iranian side welcomed the investment of Indian side in setting up plants in sectors such as fertilizers, petrochemicals and metallurgy in Chabahar FTZ on terms mutually beneficial to the concerned parties. In this context, both leaders welcomed the lease contract for Shahid Beheshti Port of Chabahar during interim period between Port and Maritime Organization (PMO), Iran and India Ports Global Limited (IPGL). They further directed that the Coordination Council should meet within the timelines stipulated in the Trilateral Agreement. 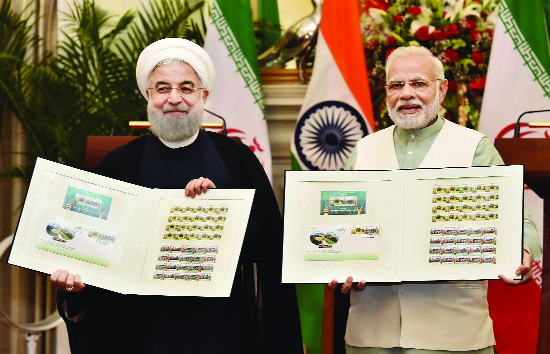 The two leaders released a joint postage stamp depicting Deendayal Port, Kandla and ShahidBeheshti Terminal, Chabahar that reflected the enhanced prosperity through greater connectivity. Chabahar- Zahedan Rail line: With a view to fully utilize the potential of the Chabahar Port and its connectivity to Afghanistan and Central Asia, India conveyed its readiness to support the development of Chabahar- Zahedan Rail line. IRCON, India and CDTIC, Iran who are engaged in discussions, were tasked to finalise the technical parameters and financing options for the project in a time bound manner. Both leaders encouraged greater efforts for cooperation in railway sector including supply of steel rails, turnouts and locomotives. INSTC and Chabahar: Both sides reiterated their commitment to International North- South Transport Corridor (INSTC) and stressed on the need for inclusion of Chabahar within its framework. It was noted that Iran will hold an early meeting of the INSTC Coordination Meeting in Tehran. India's accession to TIR Convention and Ashgabat Agreement was welcomed as additional steps at enhancing regional connectivity and linking regional centers of economic growth. Chabahar and Indian investment: The Iranian side expressed its readiness to enhance enabling environment to attract Indian private/public sector investments, in Chabahar FTZ. In this context, Iran will organise a business promotion event, with participation of countries from the region and beyond, with the objective of showcasing the economic opportunities offered by the Chabahar Port. In order to facilitate friendly exchanges between the two countries, it was agreed that India would grant e-visa facility for the Iranian nationals and Iran would grant e-visa facility to the Indian nationals. The signing of visa waiver agreement for holders of diplomatic passports was also a step in this direction. Both sides reiterated the importance of addressing humanitarian issues concerning the nationals of the two countries. Iran side will positively consider India's request to upgrade Consulates in Iran. The two Leaders exchanged views on regional and international situation. In view of strengthening multilateralism, President Rouhani acknowledges the aspiration of India to play a greater role in international fora. The two leaders reiterated the importance of strong United Nations and emphasized the need for an early reform of the Security Council reflective of the current geopolitical realities. They reaffirmed their commitment to supporting the Intergovernmental Negotiations [IGN] for comprehensive reform of the Security Council. Both Leaders underscored the need for strengthening and reform of multilateral financial institutions and enhancing the voice and participation of developing countries in international economic decision-making. They urged an immediate end to all support and sanctuaries enjoyed by terrorist groups and individuals and were of the view that States that aid, abet and directly or indirectly support terrorism should be condemned. They called on the international community to end selective or partial approaches to combating terrorism and, in this regard, stressed the need to make every effort to reach an agreement on and conclude a comprehensive convention on international terrorism at the UNGA. Both sides endorsed UNGA consensual resolution in 2013 derived from the idea of Iran's President "World Against Violence and Extremism" (WAVE) and called for combating terrorist elements and complete eradication of their supportive movements, financial support cut to terrorist groups in particular. Air services: New Delhi has signed an air services agreement with Iran enhancing the number of flights between the two nations and allowing each other's airlines to operate to additional destinations. Bilateral trade: The two sides have also inked a memorandum of understanding that is aimed at increasing bilateral trade to $30 billion from $15 billion. Maritime cooperation: Plans are afoot for greater maritime cooperation, and Iran has already joined the Indian Navy's annual initiative, the Indian Ocean Naval Symposium, which provides a forum for the navies of the Indian Ocean littoral states to engage with each other. Afghanistan: More significantly, the two nations have decided to hold "structured and regular consultations" on Afghanistan. Both India and Iran are unlikely to accept an Afghanistan that serves as a springboard for the Pakistan military's interests. While India has used its presence in Iran well to operate trade into Afghanistan, giving Kabul a much needed alternative to Pakistan and bolstering India's position in that war-torn country, today there are more problems between Iran and India than just troubled agreements. For example, the issue of alleged Indian spy Kulbhushan Jadhav currently on death row in Pakistan being kidnapped from Iran is not just an India-Pakistan matter. Revelations of Iranian access to AlQaeda and giving home to Osama Bin Laden's family after he was killed in the Abbottabad raid in Pakistan raises some uncomfortable questions for Iran in the global narrative on terrorism. For India, it is imperative that it does not constantly approach Iran in the context of its own issues with Pakistan. While the Afghanistan angle has worked for India, Iran is a geographical neighbor of Pakistan, and will have a completely different approach to its relations with Islamabad. The challenges for India and Iran are not just economic, but political as well. In June last year, Iran's Supreme Leader Ayatollah Khamenei brought up the issue of Kashmir for the first time in seven years in an address on the occasion of Eid-ul-Fitr, including Kashmir is along with Muslims in Yemen and Bahrain as among those being oppressed by tyranny. The reasons behind the timing of this event could be many, from India's growing closeness with both Israel and Saudi Arabia to the Ayatollah offering a narrative for a domestic audience. China is now Iran's largest trading partner. China has invested massively in Iran, with more than 100 Chinese companies on the ground seeking to occupy the space vacated by Western firms that had grown skittish about international pressure on the country. The partnership with China benefits both sides: Iran evades global isolation by courting China, which in turn gains access without any real competition to Iran's energy resources. Diplomacy with Iran itself is an art of its own. Much of Tehran's approach to international diplomacy is based on survivability. Sanctions, economic blockades, covert wars, and a race for regional supremacy more often makes Iran a difficult partner, civilizational ties or not. Still, it is in India's interest to support Rouhani's governance in Iran. His moderate credentials and democratic approach to the limits of what is possible within Iranian political systems is important to both regional and global stability. Rouhani's New Delhi visit, despite all the baggage, is a good opportunity for both countries to iron out their differences, make significant strides on long-pending economic topics, and discuss the regional dynamics of a destabilized West Asia. This visit should focus on deliverables, an aspect of India-Iran ties that has lost momentum amid much small talk masquerading as deepening relations between the two states. Dr. Sasikalapushpa is Member of Parliament (Rajya Sabha) & She has also Co- authored four books with Dr. Ramaswamy.